WhiMSy love: Bloggy Birthday Winners! Congrats to zachsmama, Heather of Dollarstorecrafts.com & Wendy of Blue Rock Gourds!!! 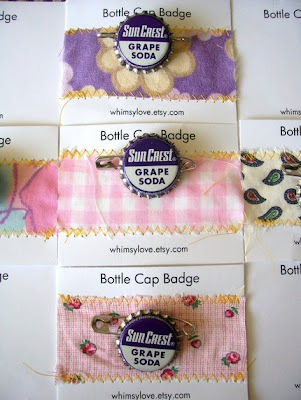 You have each won a Vintage Bottle Cap Badge from WhiMSy love!! Thanks for playing along everyone--- & for all the happy bloggy birthday wishes! P.S. If you lovely winners could please email me your addresses, I'll get yer prizes shipped off first thing next week! YES!!!! I am shocked and excited. Thank you so much! My son is going to be THRILLED with the badge. Thanks again! We got the badge yesterday and my three year-old son has been wearing it/playing with it constantly since then.